President Donald Trump and Russian president Valdimir Putin aren’t scheduled for a sit-down meeting until 9:30am Eastern this morning at the G-20 summit. But we have the first video from their meeting thanks to Facebook and German Chancellor Angela Merkel. Tools like Facebook and Twitter have changed the way that news breaks. And governments, politicians, and political parties now break stories even before the traditional news media can, thanks to social media. There’s almost a voyeuristic feel to the whole thing, especially with the way that this first handshake was recorded. Germany’s Bundesregierung posted the historic video to Facebook just a half hour ago. 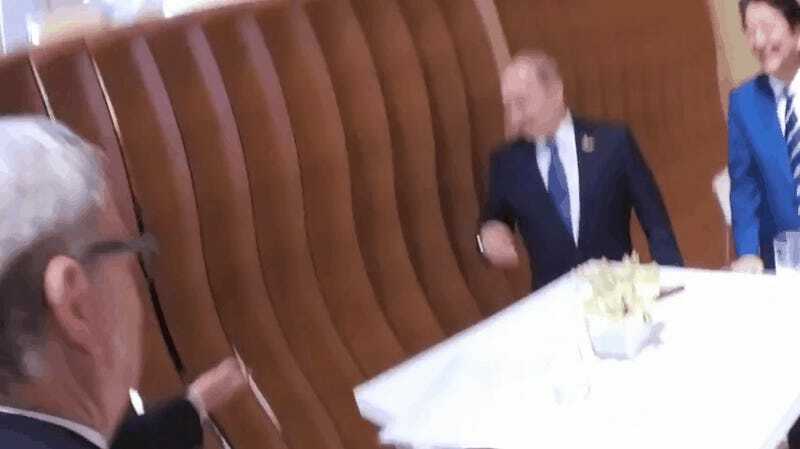 In it we can see Donald Trump and Putin shaking hands. They look a lot more friendly than when Obama and Putin last met, to say the least. Trump and Putin will be meeting in a couple of hours and the American delegation hasn’t yet said what it hopes to get out of the sit-down. But if this first handshake is any indication, they should get along just fine.